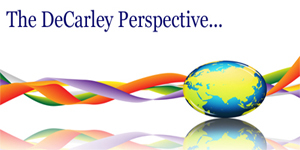 Now more than ever, many analysts and traders seem to be at polar opposites in regards to the direction of equities. For instance, David Kostin of Goldman Sachs claimed a week ago that the market had entered a "sustained rally" mode but Morgan Stanley's Jason Todd is referring to this rally as one to "sell into". If you recall, most television "pundits" and journalists were looking for the S&P to break-down into the low 800's. Those on the extreme end of the curve, were calling for a retest of the March lows; however, the opposite ensued. This month it seems as though, despite newscaster banter about a rally to 1200 or so in the S&P, the market may be setting itself up for disappointment. At the time of this writing, the broad market was relentlessly fighting its seasonal tendency for lower prices but as we head into what is normally considered the worst month of the year for the S&P things may change quickly. Additionally, just as the market was "too bearish" in mid-July, it seems as though the market has quickly become "too bullish" going into August. It is also important to note that the Stock Traders' Almanac warns investors to be weary of summer rallies that will typically fall short in time. Don't forget about Goldman Sach's prediction for portfolio rebalancing. Because stocks have considerably outperformed bonds since the March lows, investors may look to lighten their equity load and increase their fixed income holdings including $10 billion dollars of selling in equities from pension rebalancers. In addition, we can't ignore the stock market stats surrounding the previous meltdown of this magnitude. The rally following the 1929 crash lasted 147 days and came to a screeching halt after running 46% from the lows. The current move from the March lows has resulted in gains of nearly 46% and has spanned 146 days. I can't help but feel as though this will be in the back of the minds of investors. We love writing this newsletter because it keeps us in touch with the markets but it can be frustrating to realize that we called it relatively right, but throughout the month lost touch with the original plan. The chart in the previous edition of the DeCarley Perspective stated that , in regards to the S&P, "The odds seem to favor a pullback to the mid-800's, but if that area holds it could be a great buying opportunity. 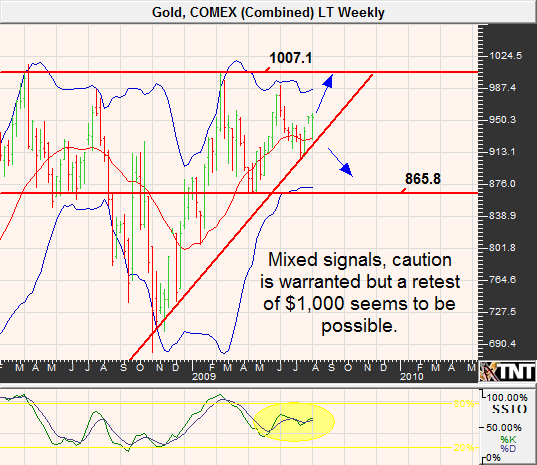 A rebound could extend just under 1000." If only we had trusted our original analysis enough to follow it! This month, we are stubbornly bearish. While earnings numbers were good, revenues weren't. Although those that are slashing costs will be in great shape down the road, we don't think that demand for goods and services will recover immediately. Eventually, the market will come to the realization that this rally may have been overdone. That said, it is important to remember that it doesn't pay to marry a position and being overly bearish is a bad idea. After all, there is a substantial amount of sidelined cash still waiting to get in and after all is said and done the market will move the way that it wants to regardless of the direction you or I think that it should. We see significant resistance at or near 1,000 in the S&P, this could mean that 1,010ish is possible but overall we think a retest of 937 and perhaps below 900 is looming. 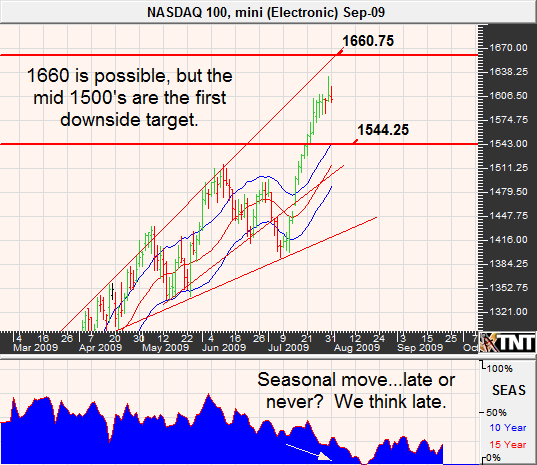 The NASDAQ has rallied against its seasonal tendency but should also see weakness in August. Strong resistance can be found near 1660, first support near 1544 but 1500 could be in the cards. 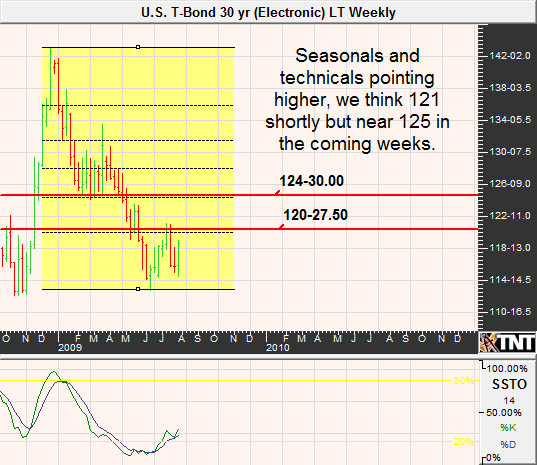 The seasonal lows in Treasuries should be in and, more importantly, should be respected. Seasonals aren't a guarantee, but I have found that cyclical tendencies in bonds and notes can be relentless, even in the face of contradictory fundamentals. Unfortunately, due to volatility and uncertainty surrounding this week's record breaking Treasury auctions, we missed the lows in terms of our Bond Bulletin guidance. In this case, opting for conservatism and patience may have resulted in us "missing the boat". However, it is always better to be safe than sorry. Going forward, if we are right about equities Treasuries should gain ground in the coming weeks. After all, record supply was met with respectable demand and the economic green shoots are relatively sparse. We think this despite the Oracle of Omaha's preference for stocks over Treasuries even with the Dow near 9,000. Keep in mind, Warren Buffet is on a much longer time horizon than we are as futures traders and a few years out I am confident that Mr. Buffet has the right idea but for now my faith is in Treasuries. Not only have investors flocked toward equities, but a substantial amount of money has been flowing into corporate debt issues as the allure of the safety of Treasuries has faded. Nonetheless, we feel as though government issued securities may come back into favor as the economic recovery struggles to meet lofty expectations. In order for our expectations of higher Treasuries (lower yields) to materialize, we will need some help from the U.S. Dollar. Weakness in the September index below 77 may undermine the bond and note rally, or at least keep it in check. We have since revised our initial expectations to just over 123 and near 120 respectively. 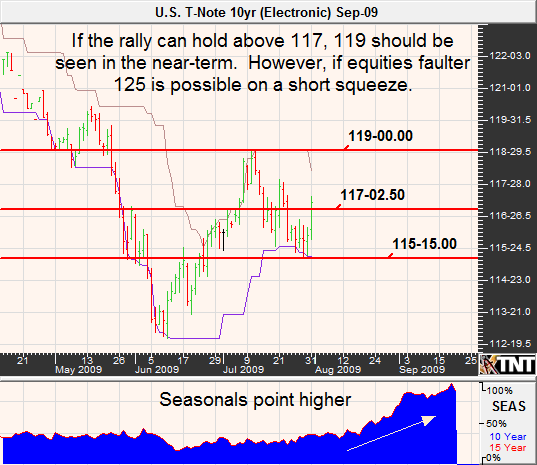 A pullback to 116ish in the 30-year bond may be supportive, while the note correction may find a floor near 115. 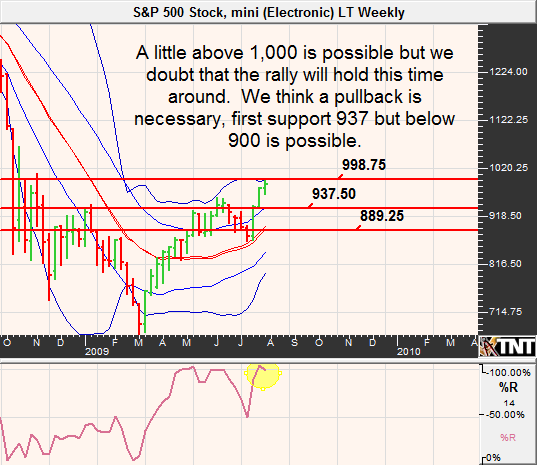 This month we are looking for the beginning of what could be a rally that spans into the fall. We are looking for first resistance near 121, but after some possible back and filling we could see near 125 at some point in august. If we are wrong about the direction and resistance near 121 holds, we could trade as low as the mid 112's. As is usually the case, the grain markets have been entrenched in an overall path of bearishness. This is typical of summer grain trade. However, late summer rallies are possible should abnormal weather conditions such as drought or flood materialize. Additionally, late June and July selling pressure often results on oversold conditions and can favor short covering rallies. Last month we had expected strength in the U.S. dollar to keep a cap on rallies. However, even in the face of a weak domestic currency, corn has been grinding lower on bearish fundamentals. 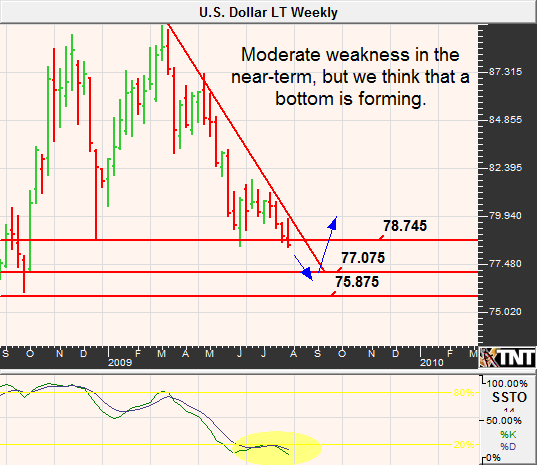 That said, the U.S. Dollar index may be nearing a low as we see 77 as critical support. If this is the case, any grain rally should be minimal for now. Remember, the harvest lows aren't typically in until October. Also helping the bear camp is the possibility of a faltering economic recovery, and thus stock market correction. A skyrocketing equity market has been supportive to commodity prices but if August lives up to its reputation as being the worst month for stocks, grains will have a tough time getting anything more than temporary short covering rallies in the coming weeks. 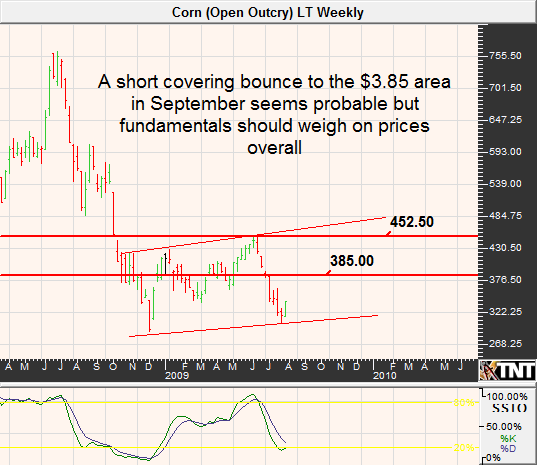 A weak dollar and technically oversold conditions weren't enough to protect corn prices from bearish fundamentals. The last DeCarley Perspective may have been right about Treasuries and equities but we were wrong about corn. We were looking for a short covering rally to occur before a continuation of the slide lower but we now know that there was nothing of the sort. On July 10th the USDA put a nail in the corn coffin by increasing their estimates of ending stocks from 1.090 to 1.55 billion bushels. This puts the ratio between ending stocks to use near 12%, which is a relatively comfortable level. Corn exports have been hit hard by the global recession, they are down about 29% from a year ago. However, the factor that has really kept corn out of favor is the great growing conditions; 70% of the corn in the ground is rated as "good to excellent" by the USDA. On the other hand, there is still talk of ethanol and although corn isn't an efficient source of the alternative fuel it seems to at least be preventing the market from melting down further. We have a hard time being a bear after such a large drop and substantially short speculators leave this market vulnerable to a short covering bounce. We would prefer to see $3.85 in September corn before playing the downside. If it weren't for a large and unexpected increase in demand from China, November soybeans may have spent the entire month of July hovering near $9.00. However, a large purchase resulted in an extraordinarily large price increase near the end of the month. Whether the market has the ability to hold gains or continue higher is yet to be seen but, as mentioned, without supportive weather the grain markets tend to continue lower overall in August. Similar to corn, the USDA has recently increased its expectations for the ending 2009/2010 stocks. Nonetheless, bean prices have been supported in recent months by hot and dry weather in South America and here in the U.S. the planting of some beans were delayed due to wet weather. 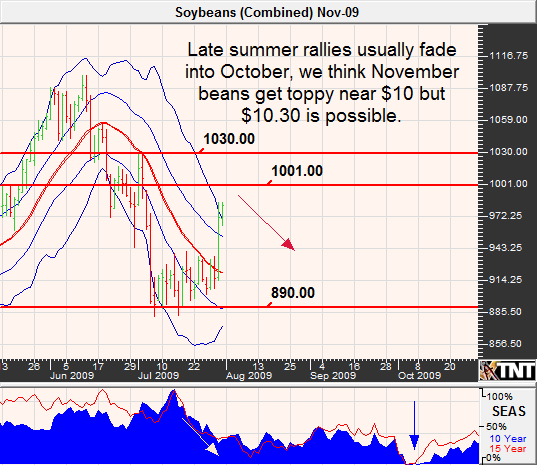 Last month we mentioned strong resistance near $10.30 in the November bean futures and expected the market to retreat to under $9. After retreated from our resistance level and posting a low of $8.80, beans are in the process of retesting the $10.00 area. While $10.30 is possible again, we doubt that the rally will extend to such levels. We feel as though traders should continue to be bearish on rallies. Wheat prices have undergone a significant amount price deflation with very little in the way of a correction. In fact, wheat is currently trading near its early December lows and with seasonal strength approaching it may be a prime candidate for a swift short covering rally. The harvest lows are typically posted in June; perhaps it is a bit late this year but the $5ish low in the September contract ($5.30ish in December) may have been what this market needed to forge a recovery. After all, rumor has it that trend following funds have amassed a near record number of short positions ...and there is only one way for a short trader to exit the market and that is to buy. 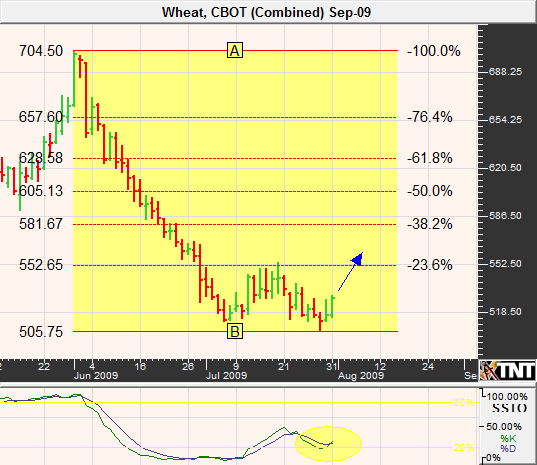 September wheat won't run into significant resistance until it reaches $5.50 but a return to the $6.30 area is possible in the coming weeks. Strength in the equity markets have allowed crude oil to rally nearly $10 from its July low; however, at some point the fundamentals will have to support the market's optimism. This is where we begin to question the rally. Additionally, our bullish expectations in the dollar (aside from a near-term moderate slide to 77 in the index) would suggest that crude prices will struggle to hold much above $70...at least for now. Also working against the intermediate-term prospects for the current rally is a steadily increasing inventory supply as reported by the U.S. Department of Energy. In the most recent report, crude oil stocks were 347.8 million barrels as opposed to 295.4 a year ago. Similarly, the world surplus capacity was only about 1.5 million barrels per day in 2008 but is now estimated to be 4.4 million. Even OPEC admits that the fundamentals aren't what they once were. In early July, the oil cartel predicted that world consumption will total 87.9 million barrels per day in 2013, up from a projected 83.8 this year, with a production surplus of about 6 million barrels per day. Last month we were calling for a correction into the mid-$50's and we got it. This time around we find our self in a similar situation and believe that the risk is in being bullish. $70 should act as significant resistance, but we cannot rule out a retest of the $73 area and with stop running a push into the mid-$70's before significant selling comes back to the market. If we do see these areas, they should be a good opportunity for the bears as we believe that $60, or moderately below, is a much more comfortable price for crude. August is considered to be a relatively supportive month for the metals in terms of seasonal tendencies. From a simplistic view, the seasonal patterns in these markets seem to coincide with our expectations for a lower stock market but contradict our expectations for a higher dollar. 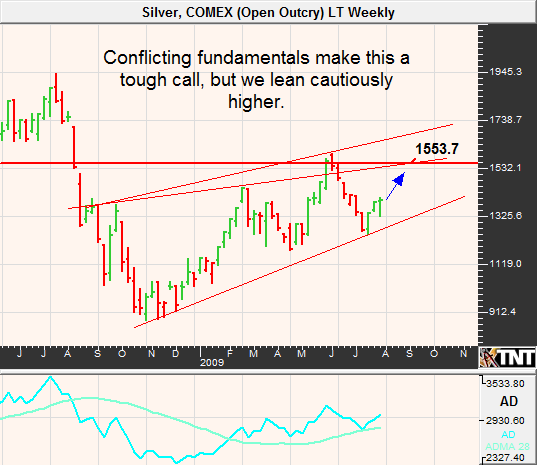 Last month the fundamental and technical aspects of the metals markets left our expectations cloudy at best and this month doesn't seem to offer any clearer signals. That said, we tend to lean very cautiously higher. December gold will likely run into resistance near $970 but we think that this market could eventually see the high $990's again. After all, if equities falter some quality seeking investors may flock to the U.S. dollar, gold and Treasuries. In this scenario, it will be possible for the dollar and gold to travel in the same direction. September silver must get past resistance near $14.30 but if it does the mid-$15's seems to be the next target. In the last newsletter, we mentioned waiting for the U.S. dollar index to dip below 78 to become a bull...and we are still waiting! 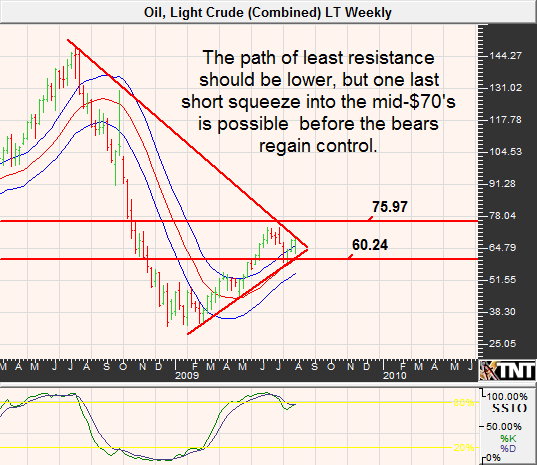 However, it now looks as though 77 is a more attractive price to begin speculating on higher prices. The currency markets didn't approve of the latest GDP figures released in the U.S. While equity traders seemed to shrug off the first quarter GDP revision lower, currency traders were busy selling the dollar against anything and everything possible. Even the Mexican Peso benefited from the event. At the same time, as bad as things were (or maybe are) in the U.S. it is difficult to find an economy that is doing any better. Additionally, the dollar is still considered the safe-haven currency and despite what China says remains the world reserve. That said, the lows may not quite be in. Low market volatility leads me to believe that the Dollar bear will have to go out with a bang and a move to, or moderately below, 77 would be a perfect way to do it. The great aspect about trading the Dollar index is the low margin requirement and the ability to purchase cheap options to protect futures positions. Traders that look to go long the Dollar index at or near 77 may also want to price out reasonable insurance policies (put options). 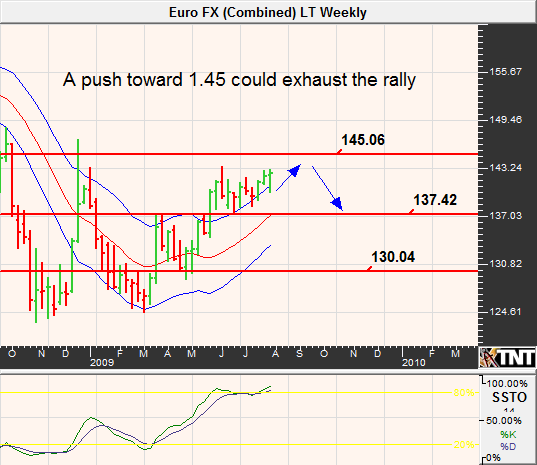 Despite challenged fundamentals, the Euro has been in favor in recent weeks. While we are overall bearish in this particular currency, we respect the fact that the rally may not have run its course. We see the possibility for a run to the 1.45 area before the bear returns. On the surface, some of the Euro zone stats seem to be a bit better than those in the U.S. For instance, the latest employment rate was 8.9% and real GDP was a negative 4.7; each of these being slightly better than that in the states. However, it is impossible to ignore the fact that the massive social programs offered by Germany, France and Italy account for nearly have of the income produced in each of these countries. Even if they have a smaller hole to climb out of, the recovery may take much longer. From a seasonal standpoint, the Euro has a tendency to decline into Labor Day weekend at which time it can become a buying opportunity. With that in mind, being bearish on rallies should be the way to go. Supportive supply/demand fundamentals, thanks to a smaller than expected Chinese crop has paved the way for a sugar rally. However, we wonder if, like many of the other markets, prices have gotten a little ahead of reality. In addition, it appears as though the rally has attracted a large speculative net long position which must be offset at some point. This leaves sugar futures vulnerable to a correction. Ending stocks appear to be a little on the light side and the stocks to use ratio a bit thin; this should keep a floor under pricing. Nonetheless, sugar normally finds its seasonal peak in early August and I wouldn't bet against it. Look for prices to retreat in the coming weeks. We see resistance in the October contract near 19 cents but think that we will see 17.41 again in the near future. Should the bottom completely fall out of prices, which we don't necessarily expect right away, 15.31 is the next major support area in October sugar futures. I hope that you followed our advice last month by getting bullish under 17 cents! During the month of June coffee prices plummeted to 113.50ish, near our 112 target; this happened in the face of USDA claims that ending stocks would be among the lowest in thirty years. As have mentioned in the previous newsletter, weak coffee prices are typical of the summer months as the market reverses risk premium in pricing related to a possible freeze in South American growing regions. In most years, a freeze does not occur and coffee spends of June and July accounting for the lack of news. The seasonal low, however, isn't normally in until mid-August. According to the International Coffee Organization, coffee consumption is said to be stable despite troubles in the economy. Coffee is a commodity that consumers aren't necessarily willing to do without, they just find "cheaper" venues to consume it. On the other hand, production of coffee is down and accordingly, so are reserves. The tight supply should give the upcoming winter rally good footing. We like the upside of coffee but wouldn't be willing to be bullish from current levels. It seems as though technical resistance and seasonal tendencies could spark a digestive move lower but the market may find support near 120.00. Hog prices caught a case of the swine flu earlier this year and have yet to recover. However, we think that things are about to change on the hog front. At current pricing, packers are hovering between profit margins in the red and black...and that is an improvement from just a few months ago in which margins were decisively negative. There is a sense that the export market may be turning the corner and imports from Canada are down about 24% from last year. These factors combined with a large decline in feed prices, namely corn, provide the fundamental base for a recovery in lean hogs. 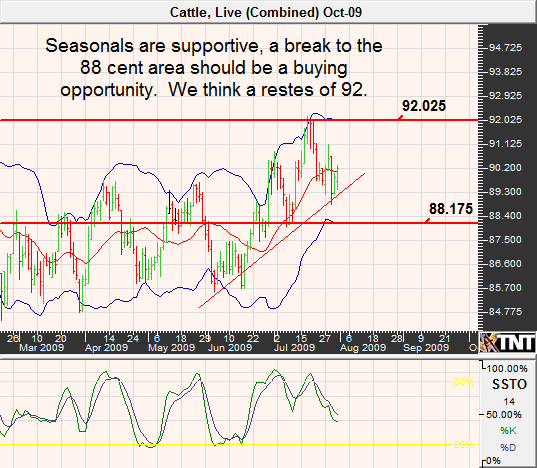 Unfortunately, the seasonal pattern in hog prices isn't as promising. During the months of August and September, production of pork typically increases putting pressure on pricing. Nonetheless, this year the USDA expects a smaller than usual hike in production and this should keep selling under control. 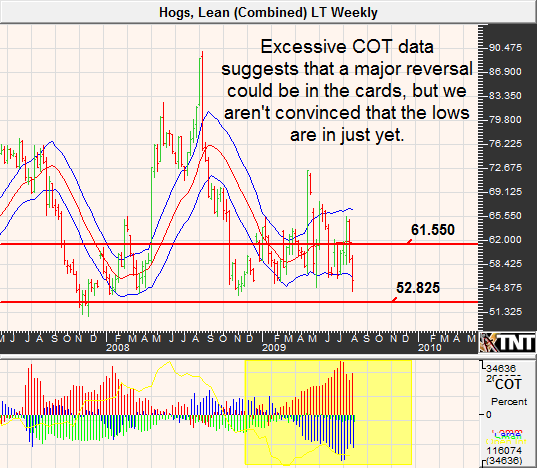 Last month we predicted that " August lean hog futures contract will continue to consolidate, and may reach prices at high the mid-64 cent range but will eventually make their way back under 50 cents. " We weren't far off, but our expectations for under 50 cents has yet to transpire. This month we feel as though weakness will be stopped short in the low 50's but a return into the 60's seems probable from there. High grain prices and low demand for meats due to the recession have left cattle prices in a compromising situation but we think that the tides are turning. After all, Beef production is down about 4% from the previous year and cattle on feed inventories are down 5.3% from a year ago and was reported at the lowest level in a decade. Our chartwork last month in this market was eerily accurate, in fact it was so precise that we chalk it up to luck. If you recall, we stated "We believe that a pullback to the 83 area is likely before resuming the uptrend. The next key resistance area is 88." This month we are much less certain in the markets path but we agree that prices will face the least resistance on the upside. It seems as though the recent swing low near 88.17 should be an opportunity for the bulls with a retest of 92ish in mind.